Forsythia (Forsythia spp.) offer brilliant yellow blossoms that usually appear in very early spring, but sometimes as early as January. If you plan on using forsythia as a hedge, it is important to plant them correctly. To successfully create this type of hedge, you’ll need to know how and when to trim a forsythia hedge. Read on for information on planting forsythia hedges and forsythia hedge pruning. Planting forsythia hedges requires appropriate spacing of the plants and regular pruning. 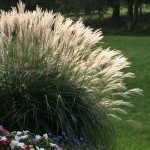 If you want a more natural look, space the plants several yards apart and allow them, over time, to partially fill in the spaces between. If you want a sheared, formal hedge, leave less space between the forsythia shrubs. When you are planning forsythia hedge spacing, take into account the mature height and spread of your species of forsythia. Border forsythia, for instance, grows to 10 feet tall and 12 feet wide. 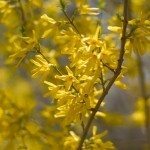 It’s easy to neglect forsythia pruning since the shrubs demand so little and grow so abundantly. But appropriate pruning is essential when planting forsythia hedges, and trimming also keeps your shrubs blossoming generously in spring. Decide the height of the hedge before you begin pruning. The size of a forsythia hedge depends on the variety of forsythia you plant, as well as the cultivar. It is possible to create a short, medium or medium-tall forsythia hedge. Learning when to trim a forsythia hedge is just as important as learning how to prune it. This shrub flowers in early spring, and buds for the following season develop soon after the old flowers fade. This means that major pruning should be done early, between the time the current blossoms die and bud set. Pruning later in the year means you will have fewer blossoms the following season. You should do major pruning very soon after flowering is completed in spring. Cut back all shoots that flowered by at least one third, making the cut at a lateral shoot or leaf joint. Cut about a quarter of the remaining growth at ground level to encourage basal growth. Trim the hedge for a second time in late July or August. This time, use hedge clippers or shears to give a light trim to shape the hedge rather than a major pruning.